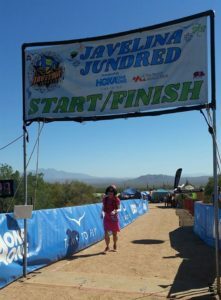 I registered for the 2017 Javelina 100 in late September, after two difficult 100-mile finishes earlier in the summer. Bryce and Leadville had gone well until I fell apart around mile 80 and shuffled, walked, or staggered on until crossing the finish line. I began to think that, at 47, old age had finally caught up with me. I worried that my finishing kick in 100s was gone for good. So, I signed up for the Javelina. It’s an easier course than what I normally choose – no altitude, no mountain passes, not too technical, not too much vert. I wanted my mojo back. I also wanted a 100-mile PR. I wanted to run faster than my 23:16 in Leadville four years earlier. 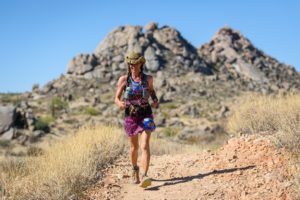 Never mind that the Javelina takes place in the desert heat of central Arizona, never mind that I had not done any heat training since August – I wanted redemption. I also wanted the race to double as a romantic getaway. My husband David and I celebrated our 25th anniversary in mid-October. When I suggested a weekend road trip to the Javelina 100, David immediately agreed (one of the many reasons why i love him). We drove from New Mexico to Fountain Hills on Friday. While going through Santa Fe, an hour away from home, I shift into panic mode: have I packed my good Hokas? We pull over. I dig through my bag. I have not. Time to problem-solve. Turning back would turn an eight-hour drive into ten hours, and make us miss packet pickup. Lucky for me, we are not too far from the Running Hub, our Santa Fe running store, where I purchase a pair of Speedgoats and put them on my feet for the rest of the day so I don’t run 100 miles in brand-new shoes. Nothing new on race day, right? The Javelina is a five-loop course. I’ve always preferred out and backs or point to points, for the simple reason that I don’t want to pass the finish line until the finish. Passing it four times, at mile 20, 40, 60, and 80 seems like a recipe for a DNF. I imagined the temptation to drop would be overwhelming – an irresistible siren call, a surefire way to break my willpower. So, in spite of hearing great things about the Javelina for years, I had never wanted to take this chance until now. The race starts at 6 am, with a counterclockwise loop that is slightly longer than the other four. We gallop off into the desert, riding high on a wave of pure energy. It’s still cool and crisp. After twenty minutes or so, I turn off my light. The sun inches up on the horizon, splashing the desert with purple, red, and shades of orange. I get stuck in the back of the pack, then break free on a section of double track and speed up – probably too much, but I can’t help it. A familiar shirtless silhouette in front of me tuns out to be Adrian – my pacer and friend without whom I would not have finished Leadville two months ago. 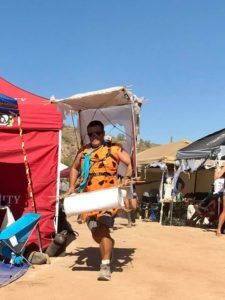 He has a plane to catch the next morning, meaning that he has to finish the Javelina in under 21 hours. I wish him luck as he scampers ahead, on his way to a spectacular 18-hour finish.. The Javelina 100 is a social race because the loops are washing-machine style, meaning we reverse direction each time we finish one. Everyone sees everyone else several times – lots of opportunities to catch up with old friends, and meet new ones. I say hello to Ian Maddieson, 75 years young, and to a 14-year old kid whose friends think he’s gone crazy. I meet runners from Ireland, Mexico, Canada, and all over the US. 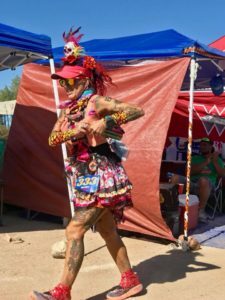 I also meet strange creatures not normally found in ultra races because lots of people run the Javelina in costumes. 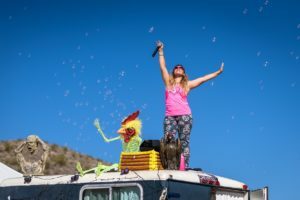 I wear a colorful top, skirt, and cowgirl hat, plus some pink hair, and some body glitter. 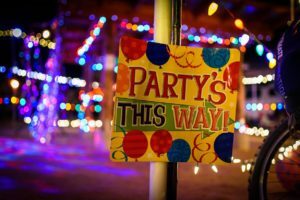 Others dressed up in much more elaborate fashion: clowns, skeletons, bandits, Jackie O, Fred Flintstone, several Wonder Women, a guy in a thong, men (and a few women) in tutus. By the time I start my second loop, clockwise, the desert is warming up. By the time I start my third, it’s hot. Really hot. I’m still running strong, but have slowed down a little, even take a few short walk breaks on the uphills. 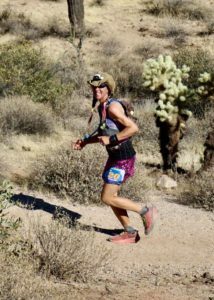 At every aid station, I stuff handfuls of ice into my hat and down my bra. 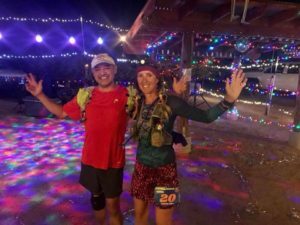 All aid stations at Javelina are top notch – a cross between tapa restaurant, night club with full bar, support group meeting, field hospital, and motivational event. Coyote Crossing offers Bloody Marys and forms of pain relief. 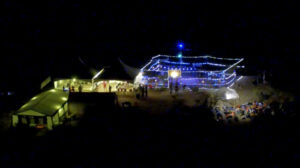 Jackass Junction transforms the desert into a dance club, complete with strobe lights and a disco ball. I leave every aid station nourished, cool, and cheerful. 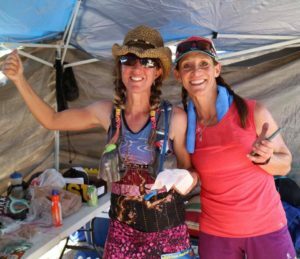 The furthest distance between aid stations is 6.5 miles, so it’s impossible to stay grumpy for long at Javelina. The afternoon sun feels merciless. I pass a couple of runners who crouch doubled over trail side, retching. I offer ginger and encouraging words, but can’t do much else. My own stomach is on the edge of rebelling after a steady all-day diet of Stinger Waffles and ginger ale. I try to reason with it. I implore it to behave better than it did in Leadville.It grumbles, the settles down again, still threatening with mutiny. 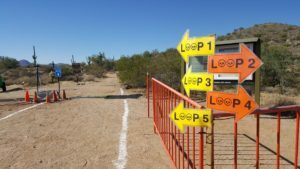 The loop course does require more mind games than usual. While I finish loop three, I think “only a 50k to go.” Wait, a 50k? It seems like a lot. I also realize that, had I signed up for the 100k instead of the 100-miler, I would be done already. Ruminating along such unhelpful lines, I reach the Jeadquarters for the third time right before sunset. I dig out my good headlamp and change socks. David reminds me to eat, so I choke down some pretzels and a protein bar. Time to refocus the mind to something more positive than the remaining 50k, like cooler evening temperatures. Like the undeniable fact that I’m more than halfway done. Loop four will my last counterclockwise round. Each loop features a gentle, rolling climb to Jackass Junction, then a gentle, rolling descent back to the Jeadquarters. The climb is rockier and steeper in the clockwise direction, but the descent is smoother and more inviting, basically an easy cruise to the finish. Now, I run back up the cruising section, finding I have plenty of energy left. The uphill is so gradual that walk breaks don’t cross my mind. I have taken a couple of very short walk breaks in the heat of the afternoon, on some of the steeper clockwise climbs, but in the cooler air, I feel able to run at a decent pace. My stomach still threatens to quit, but doesn’t actually turn inside out. I talk to it in a stern voice: “Just a few more hours, please, you finicky organ. Quit sounding like a whiny child. Don’t sabotage my race, like you did at Leadville.” And so on. My stomach has a capricious disposition. It’s easily offended and not always a good team player with my other body parts. Halfway into loop four, I switch to an all-ginger diet for the rest of the race, hoping for a puke-free 100 miles. John passes me at the Coyote aid station, looking string and steady. 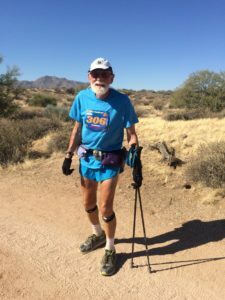 I try to keep up, but think better of it – I still have 24 miles to go, and I’ve learned the hard way to run my own race until mile 95 or so. Back at the Jeadquarters after loop four, my fuzzy brain calculates that I will have no trouble finishing in sub-22, which was my A-goal. David, my ultrahusband, is dressed to pace in his shorts and knee brace, and we head out into the night. The sound of crickets fills the night. A half moon shines above us. This is happiness, pure and simple – running through a beautiful desert, surrounded by people I care about. Eight miles in, David’s injured knee begins to bother him. He lags behind me more and more. I wait for him, but he urges me to go on alone. We reach Jackass Junction, where we snap a couple of pictures in the desert disco, then we kiss and I head out for the last ten miles to the finish. I can still run. My legs are tired, but there’s only a single digit number of miles left to go. My stomach is still on the edge of mutiny, but still holding its ginger. The night is cool but not cold, and I feel warm enough in my skirt and thin long-sleeve. I run, at a slow but steady pace, feeling peaceful in the quiet, dark desert. No need for music, no need for more motivation. I am here, the time is now, and nothing else matters. Every so often, other runners come toward me. We mutter words of encouragement, pointing our lights politely sideways and down. It’s a beautiful night, and I know I won’t see that second sunrise. My Garmin has died many miles ago, but I know that a sub -22 is possible. 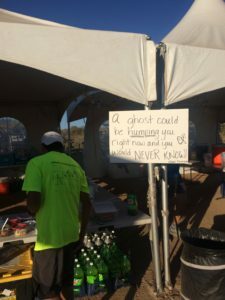 The last aid station. A last handful of ginger, fresh batteries in my dimming lights, and I’m ready for the home stretch. Less than four miles to go. I pass a couple of runners who ask me whether I’ on my last lap. They cheer me on when I say yes. I cross the now familiar washes one last time. I take a right turn off the Pemberton trail one last time. I’m hurting, but I know I’m getting close. The tent city comes into view one last time. One last pass under the arch, one last triumphant lap around the headquarters loop lined by pop-up tents filled with cheering crew members. one last little uphill toward the finish line. I see the clock. It says 20:00. I blink. I look again. It says 20:01 by the time I get there. Out of the shadows jumps my dear husband, who has caught a ride from Jackass Junction and arrived at the finish just before me. He snaps a quick picture with his phone. We hug. We feel ecstatic. I never dreamed I could run 100 miles in just over 20 hours. As we sink into camp chairs and pop open a couple of beers, I wonder: could I shave one more minute off my time? I might just have to come back next year and find out. 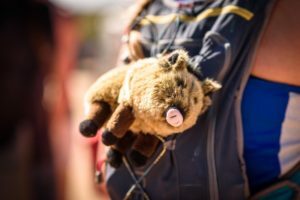 Javelina is a beautiful race in every sense: the scenery, the organization, the cheerful vibes. 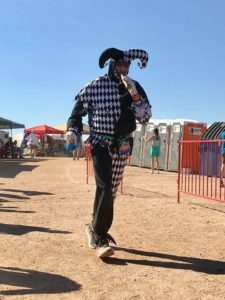 Thank you, Jamil Coury and Aravaipa Running, for putting on a top-notch event. Thank you, John and Senovia, for graciously sharing your tent. Thank you, all my old and new friends, for making Javelina a 100 miles to remember. I love you all, and I will be back. This entry was posted in Uncategorized on November 5, 2017 by silvakat. You did awesome. I’m the dude with the florescent yellow Zane grey shirt in the pic above. You passed me up so many times, you had a good pace. Great report. Steven!! Pleased to meet you. I spent a lot of time looking at the backside of your shirt, with the Zane Grey elevation profile on it. It makes me want to run Zane again (have finished it twice – what a beast!). Hope to run with you again sometime soon. 20:01, wow – well done! I remember seeing your hat out there. I love the community around this race – it made it so fun. (And thanks for confirming that you saw the guy in the thong – I worried I was hallucinating, lol.) Thanks for sharing your great report! Haha, I worried about the same thing when I saw the guy in the thong. 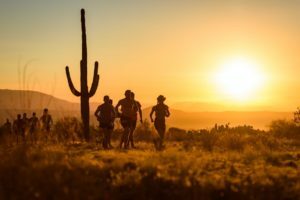 Yes, Javelina is such a great race – see you out there next year!